As you guys probably know, I’m thoroughly intrigued and in awe with the heritage and culture of the Peranakans. From furniture, to beadwork and embroidery, to jewelery and silverware, the nyonyas and babas of the not-too-distant past decorated their lives to such levels of luxury and extravagance, it is almost unthinkable, put in today’s context. This royalty-like lavishness is perpetuated in everything that they ate and used. For me, nothing speaks more about a culture than its food. Peranakan cuisine is most certainly a sparkling jewel amongst Southeast Asian culinary delights, a melting pot of many others with the Chinese and Malay cuisines as their primary influences, alongside others like Portuguese, Thai, Indonesian and even Dutch, depending on the region. 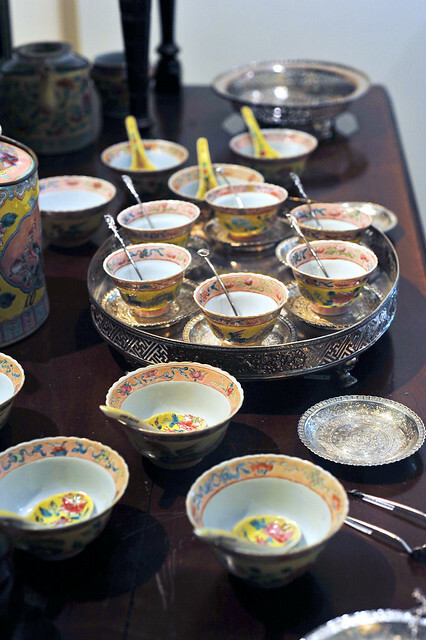 What’s more interesting is the Peranakans developed and maintained different types of porcelain ware that’s been used for every family dining occasion, from the every day lunch and dinner, to eleborated fanfares like Tok Panjang. 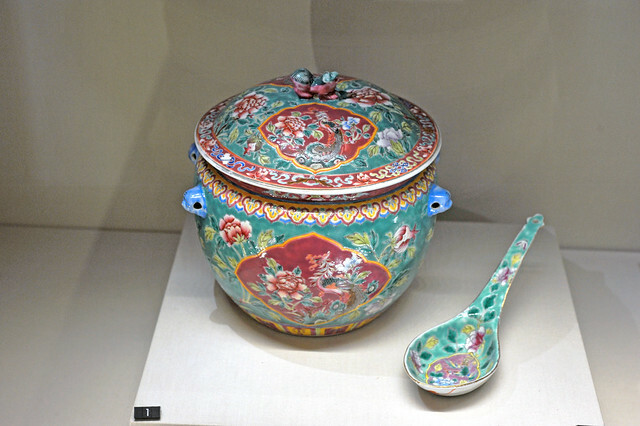 Even ceremonial ware for offerings to the deities, ancestors and mourning for a newly deceased have their own unique set of crockery, differentiated largely by motifs and color. 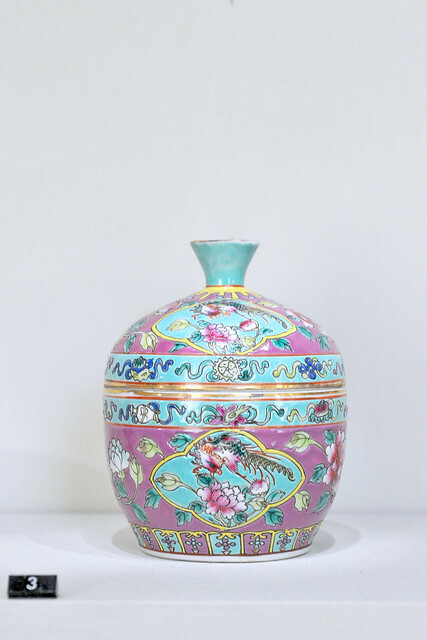 Made primarily from Jingdezhen 景德镇 in Jiangxi, China, nyonya porcelain ware are largely influenced by the “famille rose” 粉彩 coloring style during the Kangxi period, accentuated by the bold use of colors. 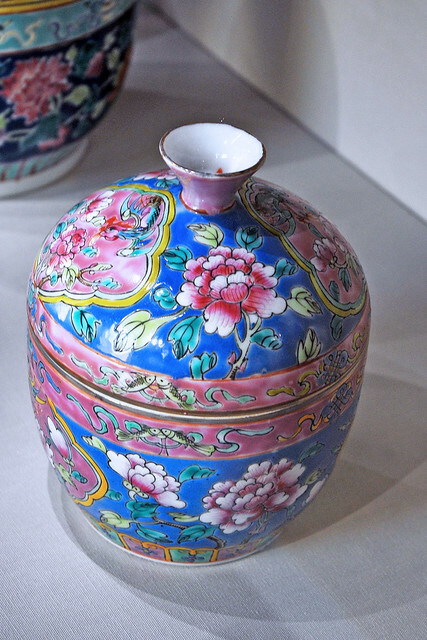 The favorites amongst the Peranakans include fuchsia pink, turquoise green, yellow, cobalt blue and purple. 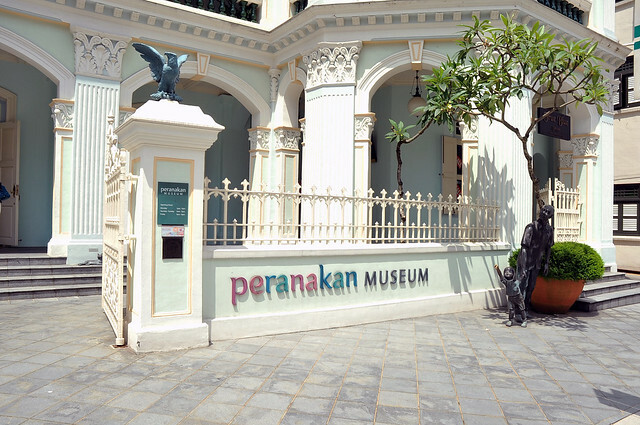 The Peranakan Museum located along Armenian Street houses a lovely collection of peranakan porcelain ware especially the colored ones, is a good place for one to begin to get to know more on what and how the Peranakans eat. 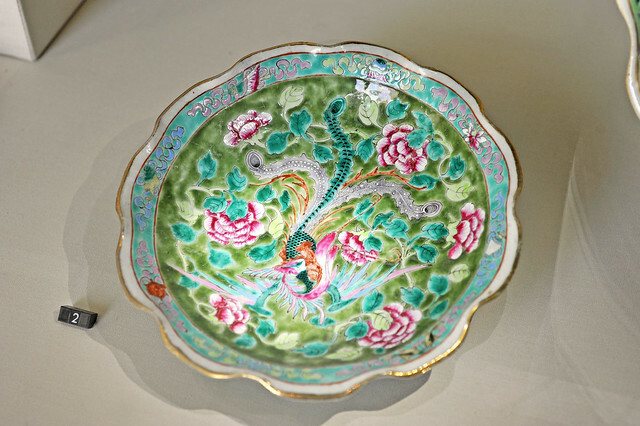 A typical motif used in nyonya porcelain ware – the Phoenix, a symbol of the matriarchal infrastructure of a Peranakan household. In this case, the phoenix is surrounded by auspicious motifs, flanked by red-crested cranes （丹鼎鹤）in the foreground, to represent longevity, magpies (喜鹊）on the trees for happiness, and a large bat with wide spread wings (蝙蝠) bordering the whole motif，which is allophonic to “福临门” arrival of good fortune. Then there is the indan lotus （莲花）on the left for 出污泥而不染，濯清涟而不妖 “purity”, as well as a peony (牡丹) for 富贵 “good wealth and luck” on the right. 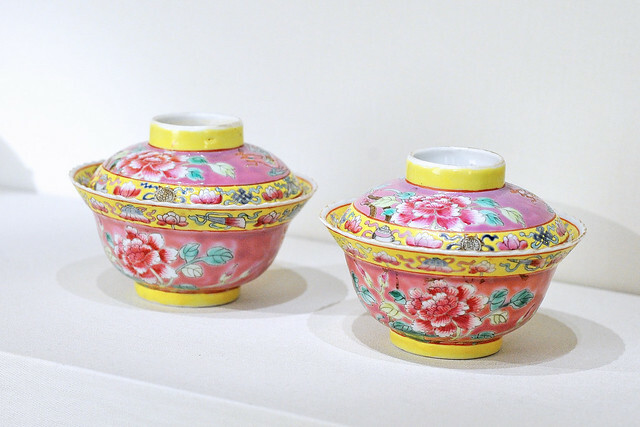 A pair of covered teabowls in salmon pink and yellow with peony motifs. Another bowl in yellow with floral edges. This piece is bigger and thus has 2 phoenixes/peonies pairs instead of just one on the pastel blue one earlier. What’s more, this is made during the 宣統 era, the last emperor of the Qing dynasty. The line drawings are significantly finer and more intricate. 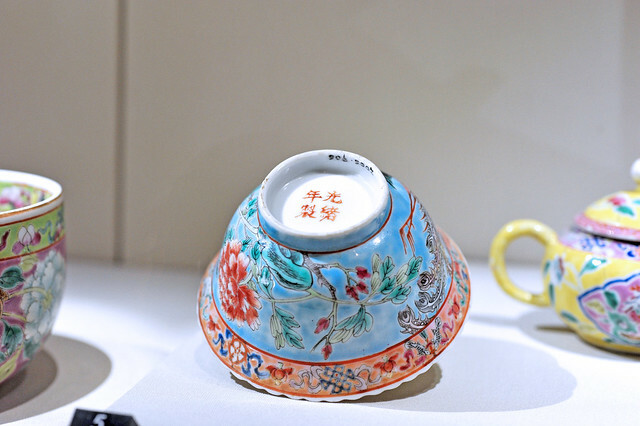 Owing to the short “stint” of Puyi’s reign, 宣統年製 nyonya porcelain ware are remarkably rare, most if not all of which are already in the hands of serious collectors. Colored ones like this yellow bowl are even rarer! A green ground kwa chee covered tray, for displaying an array of seeds, nuts and candy for the nyonyas and bibiks would nibble on, if they are not chewing on betel nuts as they play cherki. 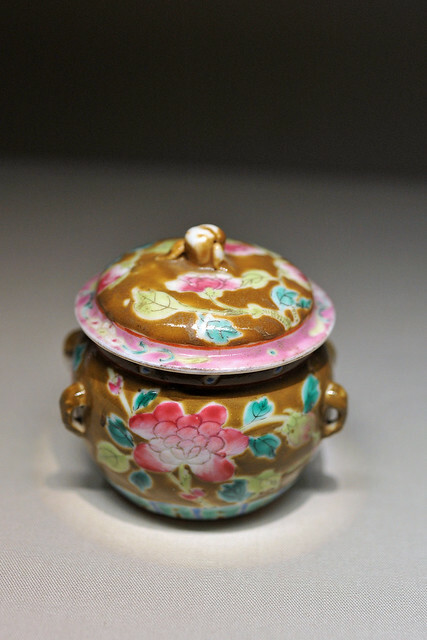 This piece is from the 同治　Tong Zhi period, made during the mid to late 1800s. 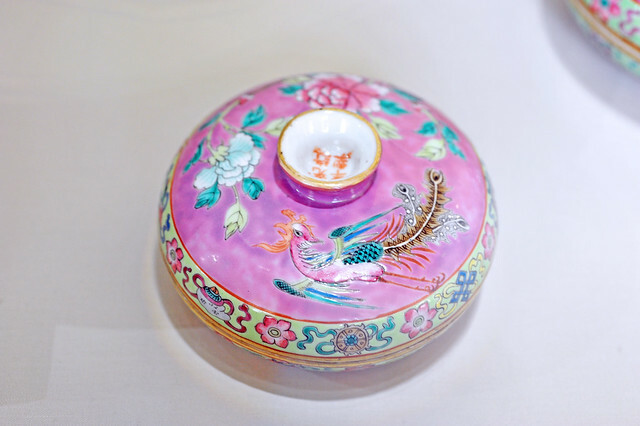 Another kwa chee tray in flamboyant fuchsia pink with 鳳凰于飛 ＂phoenix-in-flight” and peony motif made in the 光绪　Guangxu period. The lime green border shows the 八吉祥　motifs again, alternated with lotus blossoms. 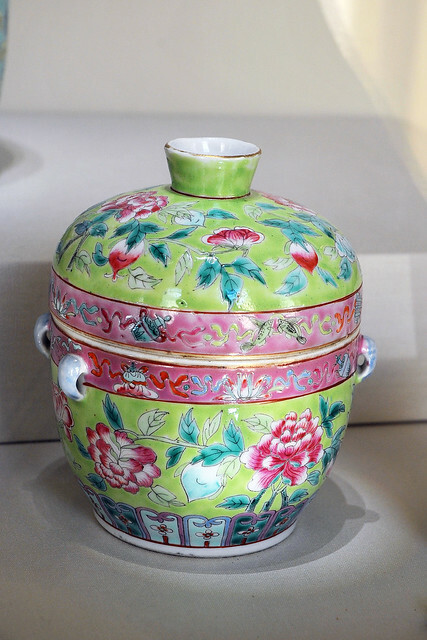 Kamchengs are covered jars used for containing and storing food items from cooked desserts or assortment of spices and condiments, depending on size. 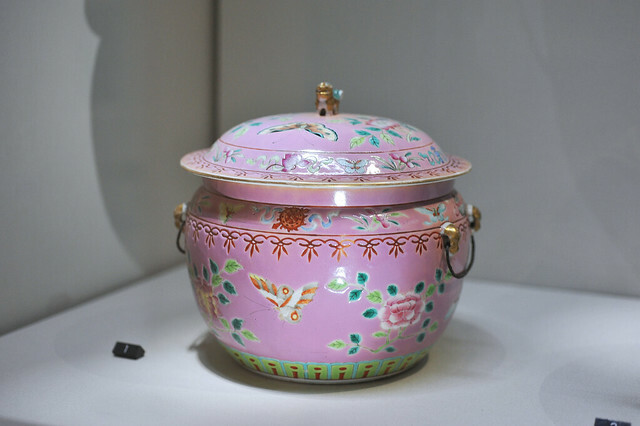 The name comes from Hokkien where kam 盖 is the lid while cheng 盅　is the jar below, and definitely not the severely romanicised “感情” in the drama serial “Little Nyonya”. This particular piece in coral red has motifs of 福禄寿　Hock Lock Siew，three deities of Taoist origins representing Good Fortune (Fu), Prosperity (Lu), and Longevity (Shou) respectively. 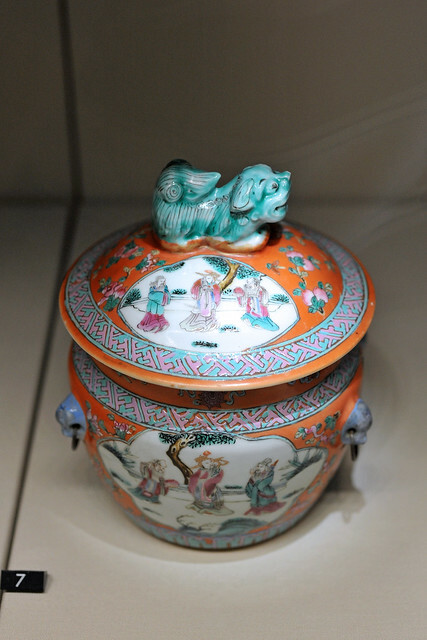 It is also decorated with 寿桃　peaches symbolising longevity with a turquoise green Fu dog as the handle/finial. Another beautiful piece in 桃红色　violet red with phoenix and peony motifs all over. One of my favorite pieces in light sky blue with the phoenix, as well as pheasants, butterflies, chrysanthemums amidst other floral motifs all over. 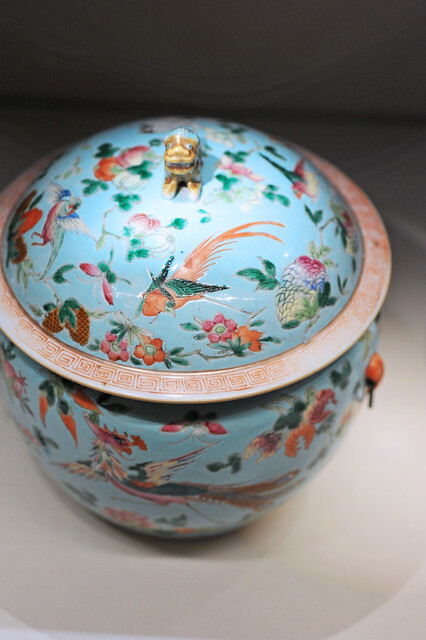 Instead of the 八吉祥 motifs, the border of the lid is decorated with a stylised Greek fret or Greek key motif. In contrast, this teal green kamcheng is much more lavishly decorated and comes with a matching porcelain ladle, ideal for scooping 汤圆　glutinous rice dumplings which are contained in the kamcheng. Pink with bright and colorful designs all over! 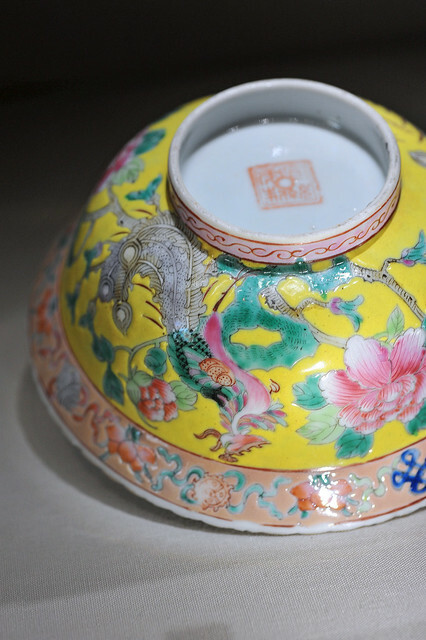 The alternated yellow and green border motif on the rim of the cover is what is known in the trade and to collectors as the “Chong Chai” motif. A large floral-edged platter on pedestal with a single phoenix-in-flight and 8 peonies around it, 7 large ones on the face and 1 small one along the border amongst the 八吉祥 motifs. 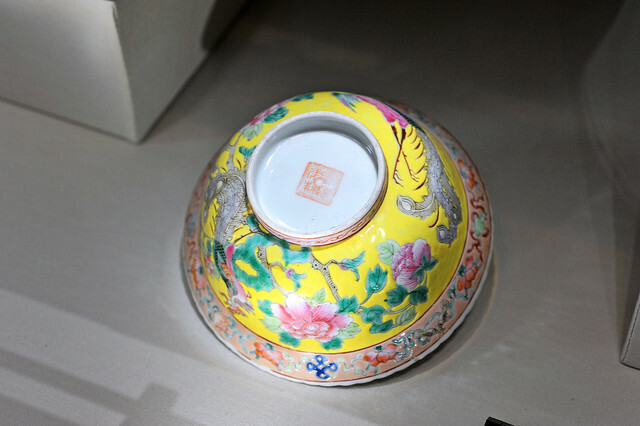 Chupu, also known as “kam au” 盖杯　is a tall bowl with a dome-shaped lid and funnel-shaped finial, the large chupu was used to contain bird’s nest and other tonic soups that the Peranakan Chinese partook of. Extremely difficult to collect as a single piece as the lid and the bowl is of a smug-fit, unlike kamchengs and breaking on part would make the other irreplaceable. The chupu is made as a single piece when it was made as the kaolin is “thrown” on a pottery wheel and then carefully slit around to separate what becomes the lid and the bowl. 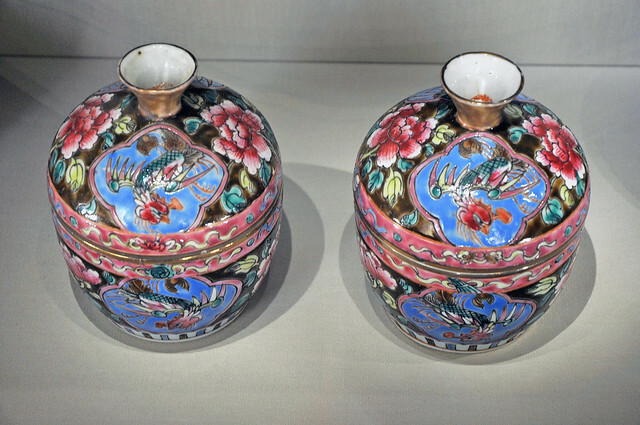 Many collectors would still purchase either with just the lid or the base bowl while the other portion remains missing as they are refined pieces of art in their very own right, in hope to reunite with the other piece in time to come. A perfect piece in fuscia pink in all respects. A “chupu” in a rare lime green with violet red peonies bearing such sharp contrast. Interestingly, this particular piece has “ear hooks” found typically on kamchengs where metal rings would be held in place, a seeming hybrid of the two. It serves as a wine-warmer. Another beautiful piece in royal blue. One of the very many chupus on display. This piece bears a standing phoenix unlike the ones “in-flight” seen earlier. A pair of dark base chupus, identical in design but alas not a mirror pair. The brushwork is also somewhat lacking compared to the other pieces and color use a tad too gaudy for my taste. In contrast, this is one of my favorite pieces on display. with very small and simple floral motifs. Another piece in turquoise green with a standing phoenix motif, serving as a sugar bowl. 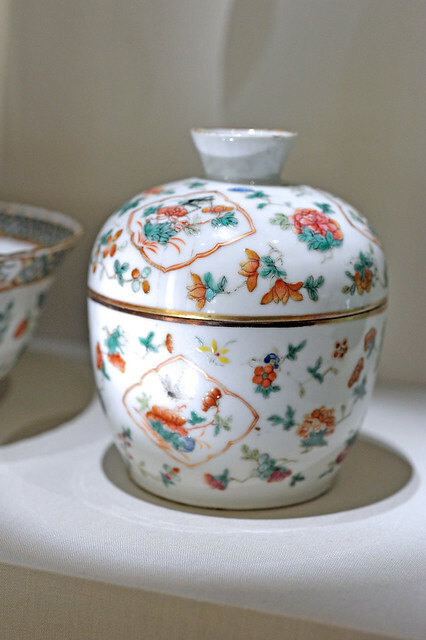 The highlight of the nyonya porcelain ware collection at the Singapore Peranakan Museum has to be the full Tok Panjang collection previously owned by Kapitan Yap Ah Loy, now belonging to and on loan from Mrs Betty Mariette. 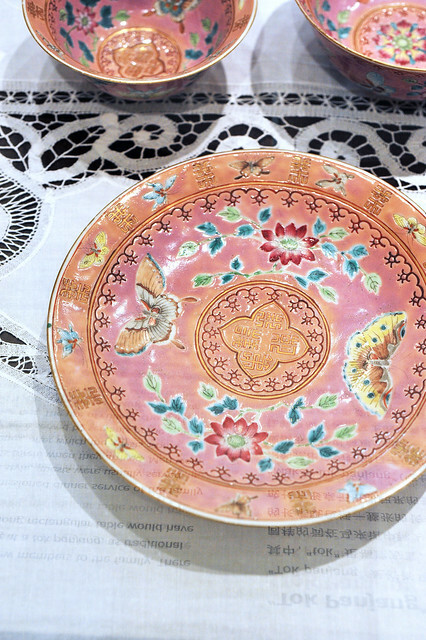 Unlike the earlier pieces, the motifs are “simpler” with butterflies and lotus blossoms. Alas, the sheer grandeur of the whole collection is a sight to behold and only a very small section of the Tok Panjang is seen in these photos and most certainly do not do the actual set justice. One’s got to see it for themselves to know it. Closeup on one of the plates, the inverted faded words come from a mirror reflection on the glass of a plaque describing this lavish set. Silver chopsticks! Talk about eating in style! An array of smaller yellow floral edged bowls resting on silver repoussé saucers, probably for serving desserts. The lot of six then sits on a large silver tray. And of course there are many more fine pieces which couldn’t be properly photograph-documented owing to my limitations and lack of in-situ ambient lighting (flash photography is not allowed). 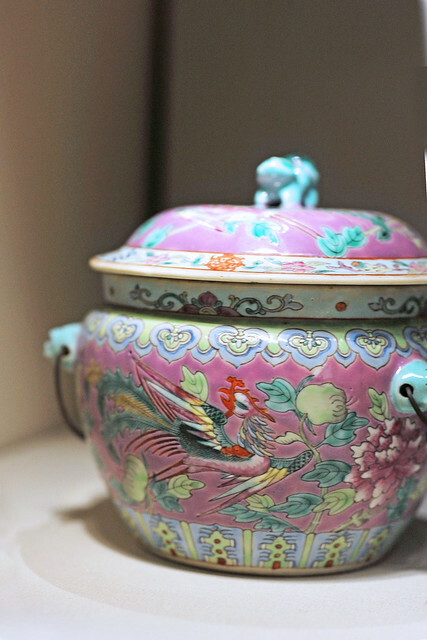 With the Peranakan cuisine close to my heart, this is my favorite gallery of the museum and definitely worth revisiting over and over again. Do join their guided tours if possible. I had the great pleasure of being shown around the museum by Ms Mutch, a Scottish lady who’d lived in Singapore over the last 4 years and knows more about the Peranakan culture than we locals! Shame on us! This entry was posted on December 16, 2011 by Alan (travellingfoodies). 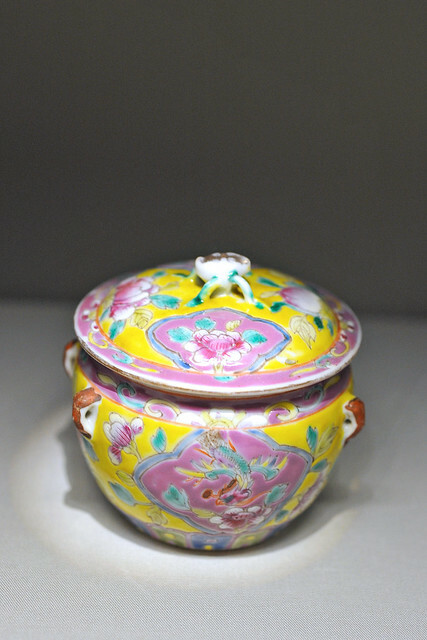 It was filed under Food, Travel and was tagged with antiques, armenian street, Baba, bowl, ceramics, chupu, crockery, cup, 盖盅, 盖杯, kam au, kamcheng, kapitan yap ah loy, kwa chee covered tray, Nonya, Nyonya, Peranakan, Peranakan Museum, plate, porcelain, qing dynasty, straits chinese, teabowl, trail of the phoenix, 光绪, 同治, 土生华人, 娘惹, 海峡华人. Our favorites happen to be the same. ah! 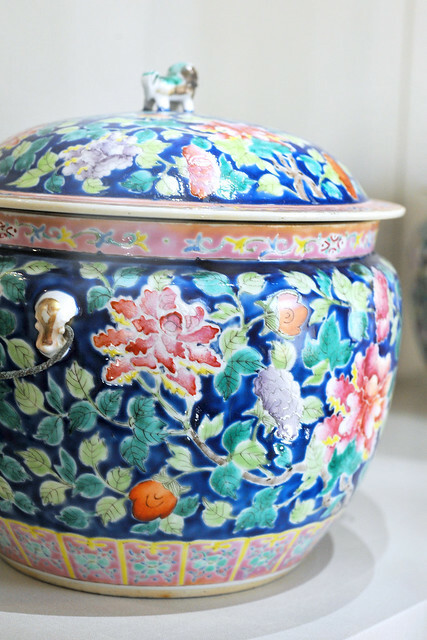 you have peranakan ware too!? nice! Dying to know what you’d collected! Hey Alan, thanks for taking us with you on the Museum tour 🙂 …. 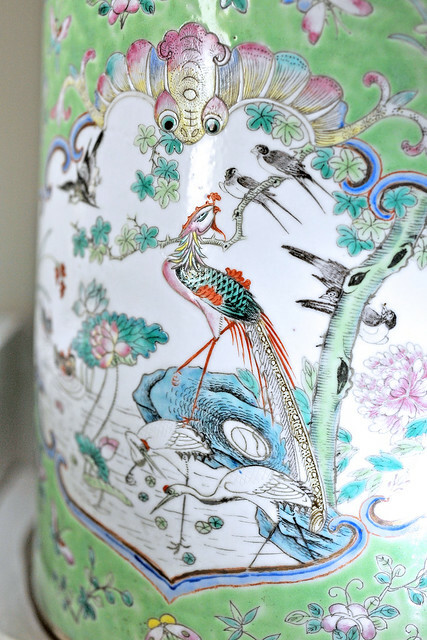 Love all the porcelain ware… I have a few pieces but they are getting so expensive nowadays. Hi Shirley! Nice to know that you collect nyonya ware as well. Yes, good pieces are so rare and difficult to come by nowadays, even when one is willing to pay top dollar for them. That said, some of them are ridiculously priced, running into the 5-digit range for just a medium-sized kamcheng. Alan, I pop by to wish you A Very Happy New Year. May 2012 bring you lots of love, hope, joy and happiness. BTW, I have been to this museum, Quay Lo loves going to Museums, wherever he goes, Museum will be top on his places to visit. 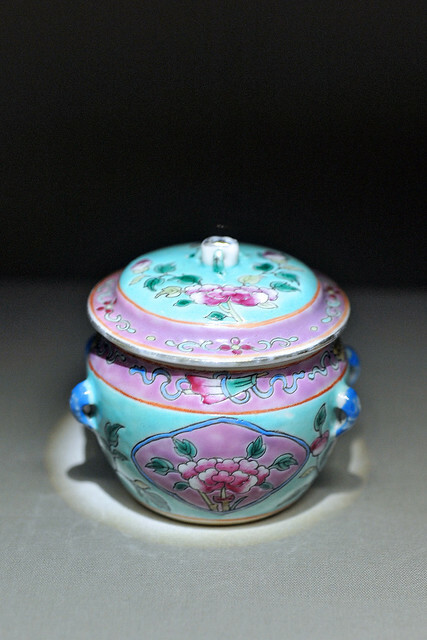 He love the Peranakan wares but he is more of a antique snuff bottle collector. We have a small collection but since we are getting old and both our daughter and son are not into collecting, we decided to sell of our collection. We still have a few nice pieces left and not in a hurry to sell unless we are happy with the price offered. Next time you come to KL, I will show you our collection. Oh we also have a small collection of Japanese Satsuma, if you like porcelian wares, you will love these. The workmanship is so exquisite and the colors and details are breath taking! Hi, thank you for your very interesting and detailed post. I proudly own a beautiful red kamcheng with red Chinese double ringmark and Phoenix illustrations. Where can I get more information about it? Hi Would like to know where to buy nice Nyonya porcelain.. Can recommend? Thank you for your comment. 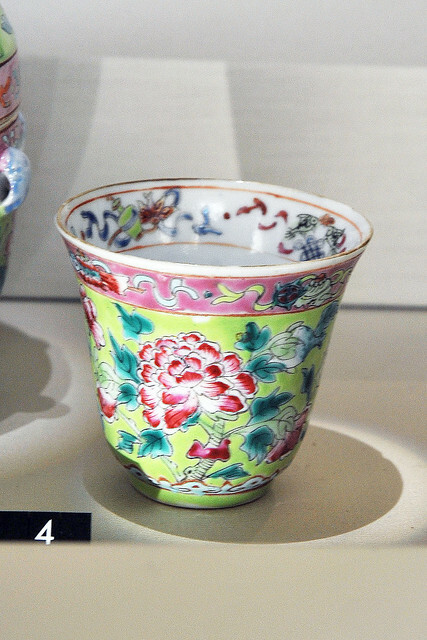 If you could, send me photos of the kamcheng you have via email (corymad@gmail.com) and I can help you check up on the mark, either from the books on peranakan porcelain or with my friends. Alternatively, you could post a link up here and we could all take a look at it. sorry for my (very) late reply due to travels! I am sending you the pictures of my beautiful red kamcheng (height approx. 30 cms and 25 cms width – will check later precisely) to your email address. I will also post a link up here. If pictures will not show nicely I will have others mad with my digital photo camera later. I don’t think any of the pieces which you have collected are nonyaware. 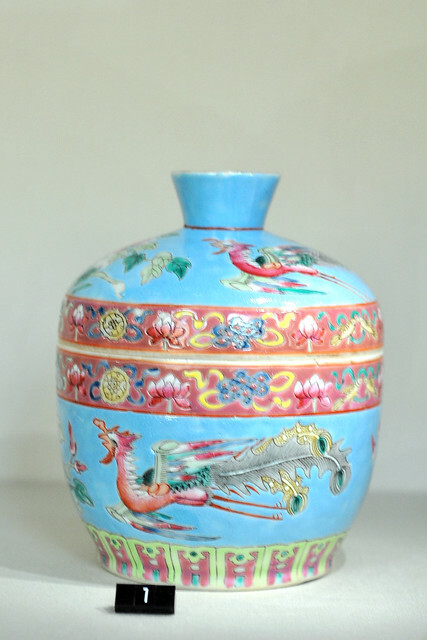 i have a nyonya like vase but has a dragon and phoenic design.this vase is nyonya in everyway except for the dragon..i saw the comment from ho wing meng book that u can haVE dragonl the vase from dr eunice thio.can i see some more examples.pleaase comment! i bought a long table and chairs from singapore yrs ago. but has dragon and phoenix onlay and dragon/tiger leg pads..
I’m not an expert in peranakan porcelain so I’m afraid I’m not able to help you with your queries. 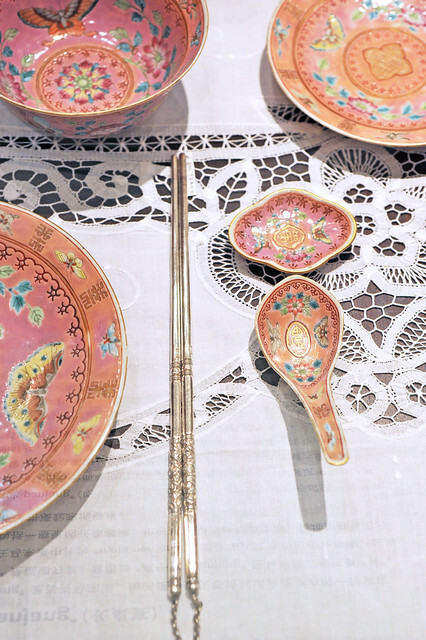 Perhaps you could contact the Peranakan Museum in Singapore or the Baba Heritage House in Melaka for more information on nyonya ware. I have recently aquired a ‘Chupu’ lidded jar and believe it to be authentic. Is there any way I could send you images in order to validate it. Can I find out where can I buy new nonya ware in Singapore and Malaysia at affordable prices. New nonyaware meaning non-antique pieces? 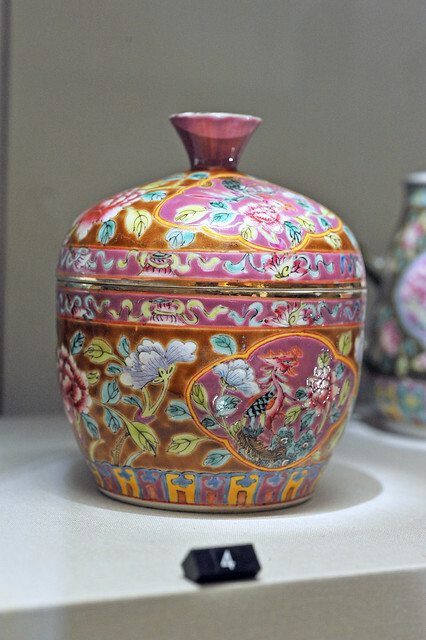 We call them reproductions, which are sold in many souvenir shops, like the ones at the Peranakan Museum in Singapore. Rumah Bebe and Rumah Kim Choo along East Coast Road in the Katong area also sell repro nyonyaware, and so does another shop in Odeon Katong. But they are purely ornamental or decorative in purpose and should not be used to contain food due to the high mercury content used. Hope this helps. 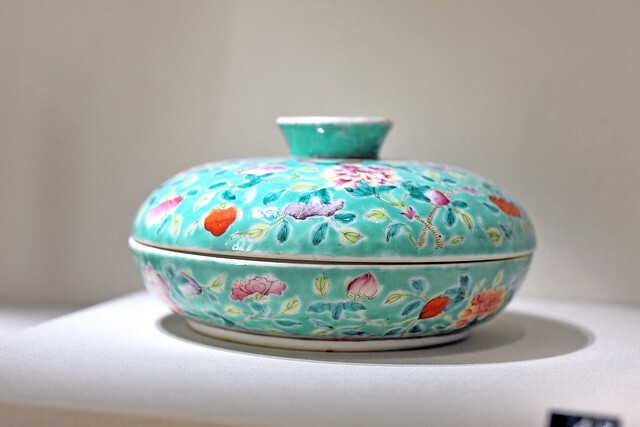 HI Alan , most peranakan restaurants eg rumah KIM Coo use this reproduction wares to serve customers. can we do something to help before it harms anyone . 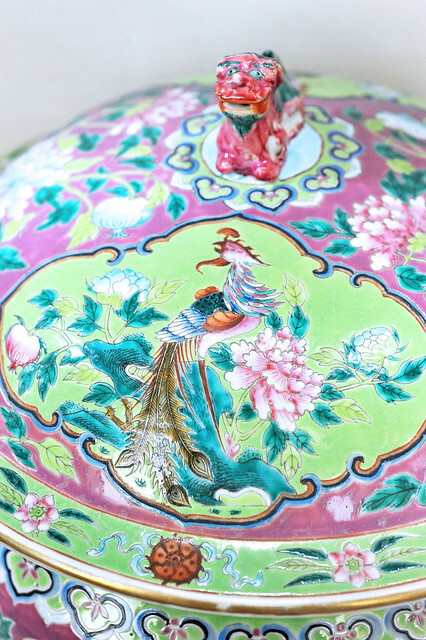 I have two beautiful wall pieces of Peranakan Porcelain with Phoenix design, does any one know anything about these? Thank you for the great article! I always loved nonya flatware and am now returning to skngaporenon a short trip with my girlfriend and been telling her we should buy some nonya flatware – your article helped a lot! Would you be able to recommend where to buy it? Dear Sir, I have acquired a blue and white Kamcheng with a six legs spider on its cover but I see other are with Lion dog on it. Wonder what is it and kindly advise. Many thanks. hi Alex, the conventional blue and white kamchengs with blue pea flower motifs tend to have a resting foo dog as the finial as you’d mentioned. The “six leg spider” you’d mentioned is actually a peach but I’d not seen that on blue and white kamchengs before. 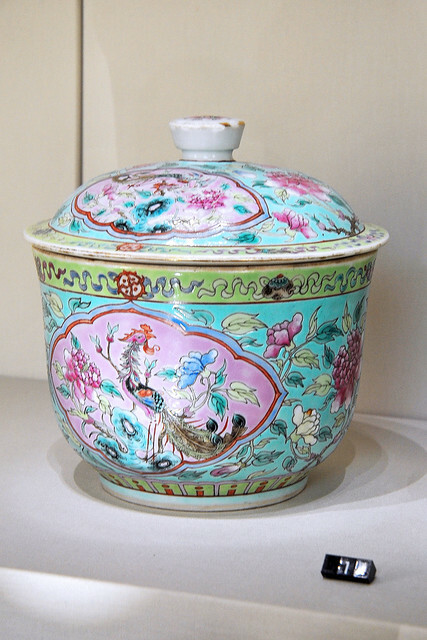 They tend to be found in smaller kamchengs with coloured overglaze instead. My aunt bought a Kam Cheng from Kim Choo in Katong a few years ago…..In many of the cooking competitions organised by her organisation (a hospital), the Kam Cheng had been a piece on the competition table. And she has always been one of the top winners. During this year’s competition which was held last Friday, 17 Oct 2014, again she was the champion selected by the panel of judges and as well as the winner of The People’s Choice voted by the public and staff. However, due to my mishandling (I was there to assist), I broke the Kam Cheng. She is quite affected by it as the Kam Cheng had accompanied her through a few cooking competitions. And I really feel very apologetic about it. Could you advise where best I could source for another one with the most reasonable price? Thank you! Sorry to hear about the unfortunate accident on your aunt’s kamcheng. Since your aunt bought the kamcheng from Rumah Kim Choo, I would suggest that you go there to get a replacement for your aunt. Call them and ask if they have stocks. Rumah Kim Choo has undergone quite a dramatic makeover in recent months. It might be worth the effort to bring your aunt along with you. Perhaps it would be an inspiration for her for her future cooking competitions. Let me know if they don’t have current stocks. I will point you to other possible sources for a replica kamcheng. Hi Alan, I just went to Kim Choo today. Somehow, I feel those that the shop is selling are not quite like the one we had. Could you recommend other possible avenues where we can take a look? The porcelain wares are so unique. 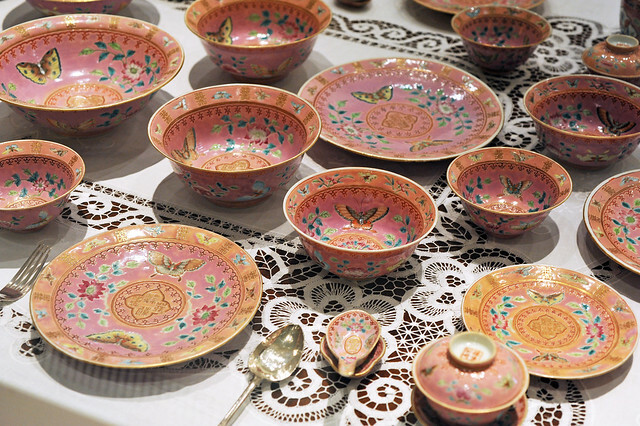 Hello, Would you be so kind to share with me where I can buy peranakan crockery, plates, tiffin, etc ? Not the antique ones but for daily use. I am thinking I have to go to Melaka to buy…. Thank you so much. There is only one set of nyonyaware reproduction pieces which are safe to be used for food consumption. 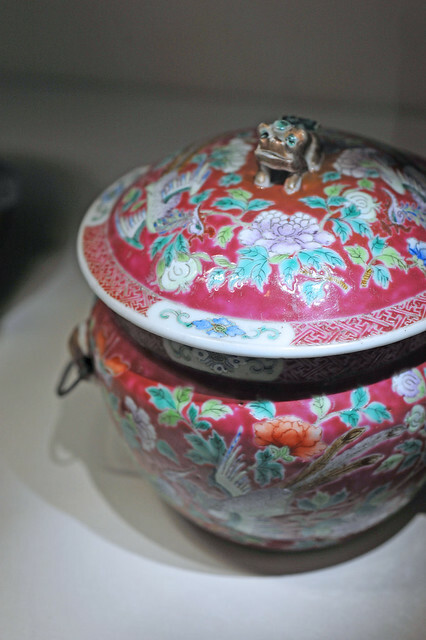 The others are usually sold as ornamental pieces and not safe for storing food as lead and other heavy metals are used in the glaze which may be poisonous. The dinner service I was referring to is commissioned by the Peranakan association in Melaka. In that case, i can approach Peranakan association in Melaka to purchase ? You try contacting “lee yuen thein” on Facebook. 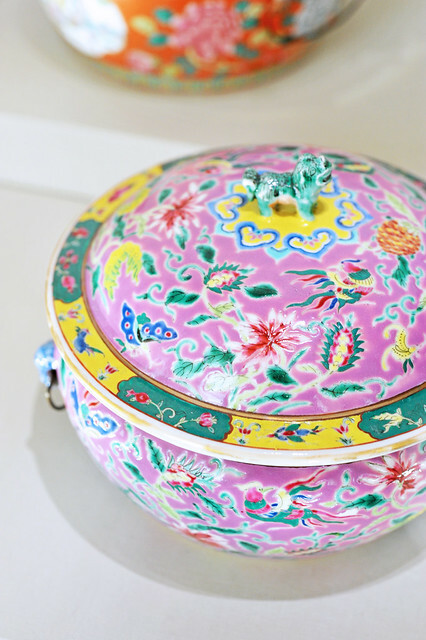 A friend of mine wants to know how to differentiate real vintage & modern imitation peranakan ware.